(Gainesville, Ga., Dec. 27, 2016) - Just below the spot where Micah Owings' glove touches his wrist, the word "faith" is tattooed in bold letters. In his old windup, the word would flash in his line of vision as he came set before every pitch. It provided him with conviction in himself and his religious beliefs during his MLB career, but it took on a different meaning as he matured at baseball's highest level. "Faith for me was deeper than faith in making a pitch," Owings said Dec. 20. "It was faith in getting me through all these different challenges that I've had in the game and life." The Gainesville native has had his fair share of those. Despite a promising rookie season in 2007, Owings bounced from team to team for six years. A slew of injuries made it even more difficult for him to catch on with one club, sending him tumbling through the minor leagues and eventually out of professional baseball altogether. But after a season in an independent baseball league rehabbing his craft and confidence, the 34-year-old finally received a chance to make it back to the Major Leagues. The Seattle Mariners on Oct. 24 signed Owings to a Triple-A deal that included an invitation to spring training, where he plans to pitch his way onto the organization's MLB roster. "When I got the call, I got a little emotional. I was just looking to go to winter ball, just to prove that I'm ready and for the exposure," Owings said. "The first time through, I was a prospect. The opportunity was kind of right there and available. "Now, on the back end of things, you've got to fight harder and believe more. You've got to dig deeper." His path back to baseball's biggest stage has been a long and difficult one, beginning with his final appearance there in 2012. But faith has propelled Owings through those trying four years and given him hope about making the Mariners' Opening-Day roster this spring. "You look at his story, and it's a story of perseverance, faith and believing in himself and his ability that God has given him," said Matt Tuiasosopo, Owings' brother-in-law and a player in the Atlanta Braves organization. "It's a story of fighting for what you believe in, having confidence in the man and athlete that you are, and not believing in the naysayers and the people that have given up on you." "Faith" wasn't always the only word on Owings' wrist. Sometimes "conviction" would appear there, and other times it might be "trust." But these messages scrawled just under his glove hand during MLB outings weren't written in permanent ink. "Before I got (the tattoo in late 2008), I used to take a Sharpie and write different words on my wrist during a game for that conviction," Owings said. "Just for that vision right in front of me before I make a pitch." The tactic worked wonders during his rookie season. Owings emerged as an electric young player for the Arizona Diamondbacks, one who could throw a shutout and record four hits at the plate in the same game. That two-way talent he developed at Gainesville High helped him win a Silver Slugger Award, which is presented to the best offensive player at every position in both the National and American Leagues. Looking back on that explosive year, Owings acknowledged the honor but said he didn't even know a pitcher was eligible for it. He was too preoccupied with the sights and sounds that came with being a professional baseball player. "I was like a kid in a candy store," Owings said. "I had to pinch myself some mornings, waking up in a king bed in a Ritz-Carlton in different cities. My dreams had become a reality, and I was living it." Initially called up as the fifth starter while the recently acquired Randy Johnson recovered from a back injury, Owings went 8-8 with a 4.30 ERA and 106 strikeouts as a rookie. He hit .333 with four home runs and 15 RBIs — eye-popping numbers for a pitcher — as the Diamondbacks advanced to the NL championship series. From there, Owings struggled to catch on in one place. Arizona traded him to Cincinnati late in 2008, and his numbers at the plate and on the mound dipped during a full year in the majors in 2009. The Reds sent Owings down to Triple-A in summer 2010, prompting him to enter free agency. Owings seemingly revived his career in the place where it begun. He returned to Arizona in 2011, going 8-0 as a spot starter and long reliever to help the Diamondbacks win the NL West and return to the playoffs. "I thought I was going to re-sign there," Owings said. He didn't. The Gainesville native became a free agent after the season and signed with San Diego, where his faith would be tested more than ever before. On top of proper technique and mechanics, Owings is trying to teach aspiring baseball players to have unyielding faith in the face of doubts and fears. It's part of the lessons he hoped to instill at this week's 13th annual Ozone Christmas Baseball Camp at Riverside Military Academy. The camp, which was held Monday-Wednesday, is a product of the Ozone Sports Institute, which Owings founded in 2006 with his brothers Josh and Jon Mark. Micah was once like some of the kids he's now mentoring, a young baseball player from Gainesville oozing with talent. "There are a lot of kids in camp you can look at and say that's a natural athlete right there," Josh said. "He's got the God-given tools, but what's he going to do to develop them?" Micah and Jon Mark, who is a retired professional baseball player, made sure to develop their potential. Even after participating in a basketball game, the younger two Owings brothers would spend an hour in the batting cage. That extra work paid huge dividends for Micah, who led Gainesville High to back-to-back state championships in 2001 and 2002. He became one of the most sought-after high school prospects after a dazzling senior season during which he tossed 121 strikeouts with only three walks while going 12-1 with a 1.03 ERA. Micah also hit .448 with 25 home runs, helping him claim the Georgia high school career home-run record with 69. Those gaudy numbers, especially on the mound, represented two sides of the same coin to father Jim. "He has got great control," Jim said. "That also tells me that he hasn't always faced the best batters in the world, so let's see what happens at the next level." Micah bypassed a second-round offer from the Colorado Rockies out of Gainesville High, opting to play two seasons at Georgia Tech before transferring to Tulane. The Green Wave reached the College World Series in 2005, and Micah became a third-round pick of the Diamondbacks. He quickly moved up through Arizona's farm system and garnered national attention as a rookie, but Micah hasn't forgotten his roots in Gainesville. Thanks to sponsorships, Micah and his brothers were able to stage their camp free of charge for the second straight year. "To me, a professional athlete has a responsibility to the community," Jim said. "You've earned the right to be here, now show them that you've earned the right to stay there and be a part of that team." For a few years, Micah rarely saw his "faith" tattoo flash in front of his face. That's because he wasn't pitching. Less than a month into his stint in San Diego, an elbow injury forced Micah onto the disabled list and eventually prompted him to undergo season-ending surgery. "When I watched him in San Diego, I knew there was something going on with his body," Jim said. "I thought it was mechanics. But his body was overcompensating, and he was wrecking his mechanics." Desperate to continue playing after the Padres released him, Micah converted to a full-time position player when he signed with Washington in 2013. He said he had been considering trying his hand in the batter's box prior to the injury, but that was ultimately what made him switch. "There are very few people that have gone down that route or had those opportunities," Micah said. "That elbow injury just kind of pushed me over the edge." The Nationals released Micah in July 2013, and his following stops as a two-way, minor league player with Milwaukee and Miami didn't pan out. Two starts into his Double-A stint with the Marlins, the 6-foot-5 hurler sustained a partial lat tear, but doctors missed a slight strain in his triceps that worsened the injury. No professional opportunities arose in 2015, but Micah said he wouldn't have been ready to play anyway due to the extensive rest and rehab program for his shoulder. "I was rehabbing for two years, going three and four days a week for sometimes two and three hours a day," he said. "I was driving to Atlanta and Woodstock. I wasn't just doing it here in Gainesville. There were times when I was like, 'What am I doing? Is something still going to be there?' "
Despite the doubts that crept in, Micah said he never envisioned himself willingly walking away from baseball. He would keep trying to land a roster spot until opportunities stopped coming. Micah's desire wasn't the problem — MLB squads were understandably reluctant to take a chance on an aging pitcher with a history of injuries. Jim urged his son to sign with an Atlantic League of Professional Baseball team to convince Major League squads he could still be effective. "I told him the only way he was going to get back was playing indy ball," Jim said. "I said, 'Major League teams won't want to touch you until you prove you're healthy.' "
Micah signed with the York Revolution on Apr. 21, just 10 days before his first start. Though the independent league was filled with other former players, the former Silver Slugger said it was more humbling than being relegated to the minor leagues. But it was a leap of faith Micah had to make if he wanted to revive his MLB career. "He was going to do what he had to do to get back to where he believed he should be," Josh said. York's coaching staff needed to have a little faith in Micah. When he signed with the Revolution, he agreed to start games only if coaches would cap his outings at an inning or two while he got acclimated to live action for the first time in two years. "I had to get my confidence back, had to get a feel back for game situations and just competing again," Micah said. "People talk about riding a bike. It's not that simple, especially when you're facing professional players that have big-league time." 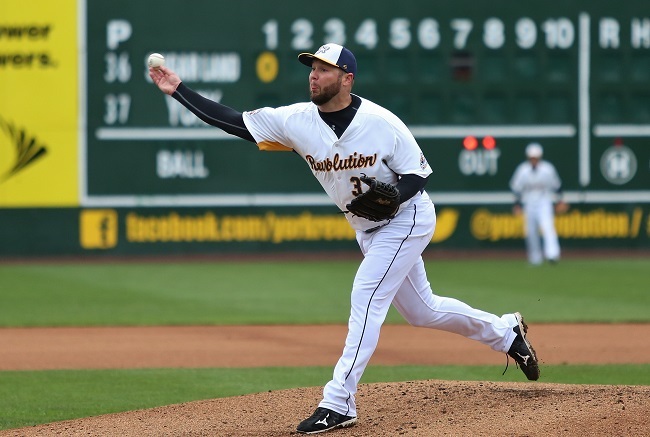 York's coaches obliged, and Micah didn't throw five full innings until his eighth start. But he gradually regained endurance and zip, even while battling occasional hamstring tightness. He went at least six innings in nine of his last 10 appearances and finished the season having tossed 111.? frames, surpassing his preseason goal of 100. The Gainesville native's two years of grueling rehab were finally validated. "It's freeing once you've gotten on the other side of that, when you've thrown 100-plus innings again and you're hitting the low 90s again," Micah said. "You're getting hitters out and making them look stupid. Those are the kinds of thoughts that when you're going through those periods have to keep you going." But no MLB teams came calling. "At that time, I was questioning things," Micah said. "'Am I labeled now? What's going on?' "
Every day during Micah's stint with the Revolution, Jim called him and asked if he had heard from any professional clubs. When Micah didn't have any good news to report, Jim was always there with some fatherly advice.
" 'You didn't get here in a day,' " Jim told Micah. " 'You didn't learn the ABCs the first time you heard them. You had to practice, practice, practice. To get back to where you were, you're going to have to pay your dues. Nobody is writing you a blank check.' "
Micah finished the season in York with a 7-6 record, a 4.73 ERA and 83 strikeouts. His final outing came Sept. 21, and for more than a month he was left wondering if his inquiries with several MLB teams would ever pay off. Then Micah got the call from Seattle general manager Jerry Dipoto, who was an assistant in Arizona's front office during Micah's time with the club. The Mariners were inviting Micah to spring training, a place he had worked so hard to return to again. "I was floored," he said. "I told him I was ready. Let's sign it right away, send it over. I'm not trying to negotiate. Let's get it done." The Gainesville native on Feb. 14 will report to Peoria, Arizona, for Mariners training camp with all other pitchers and catchers. As a 34-year-old pitcher with a career 32-33 record and 4.86 ERA, the odds are stacked against him making the MLB roster. That's why Micah has adapted his training regimen to slowly ease his way back into playing shape. He's currently progressing through his pitching program and isn't yet throwing from the mound. But the next time Micah does, a glance at his glove will remind him of the faith required to make his MLB comeback bid a reality. "He has kept fighting through the doubts and continued to move forward in faith," Tuiasosopo said. "He knows, 'God has given me this ability for a reason, so trust in that and enjoy going out every day in the process.' I'm proud of him as his brother-in-law who knows the whole process for him to keep believing and keep fighting every day."